Is the awkward second album better than before? The Optimus L5 2 is a decent device. In a less crowded market, or against less of its siblings, we could see the L5 2 carving out a bit of a name for itself. However, it's up against Samsung's Galaxies in a very crowded market. It seems a long time ago that LG was helping dominate the mobile market, with phone offerings such as the LG Chocolate. In reality, 7 years is more than a long time in tech, with LG's more recent mobile offerings often failing to hit the same mark they did before. That said, LG's partnership with Google created not only the latest (and possibly last) Nexus 4 device, but also one of the hottest pieces of mobile tech that easily rivalled the Samsung Galaxy S3 and iPhone 5. Much like Samsung, LG is banking on its Optimus range, now equipped with the Optimus G Pro and Optimus 4XHD, to take on the world. Aimed at the budget end of the market, LG created the L Series, now in its second iteration, packed with the LG Optimus L3 2, Optimus L5 2 and the upcoming Optimus L7 2. Hitting price points of around £13 per month, or £120 out right, the Optimus L5 2 is set to battle it out against the Huawei Ascend G510, Sony Xperia J and Samsung Galaxy Ace 2. Does it have the clout? LG is hardly reinventing the wheel with the design of the Optimus L5 2, with a very square all glass front and prominent home button sat front and centre, just below the screen. We can't help but feel a tiny bit disappointed with this kind of design, as we love design innovation, but the Optimus L5 2 is a very smart piece of kit. Measuring in at a 117.5 x 62.2 x 9.2mm, and weighing in at 103g, LG has created a slim and light device. The Optimus L5 2 sits very comfortably in the hand and the pocket, and at only 66 per cent the weight of the Ascend G510 is a lot less noticeable. Despite the weight, or lack of it, the build of the Optimus L5 2 still feels sturdy. As we said, LG's L Series was designed to be the budget range, with the Optimus L5 2 sitting right in the middle of the Optimus L3 2 and L7 2. With this in mind, we weren't expecting mind blowing specifications, and the 1GHz single-core processor alongside 512MB of RAM and 4GB of storage seem to fit with the pricing, although LG has seen fit to equip the L3 2 with the same specs. Interestingly, the LG Optimus L5 2 seems to have near identical specifications to the lower powered Huawei Ascend G330. This is more than a little confusing. 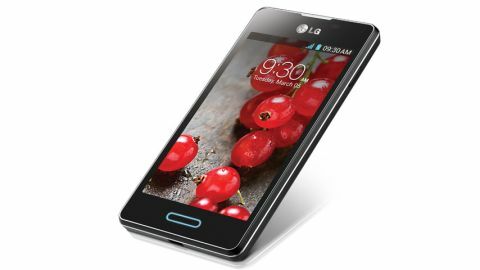 LG does equip the Optimus L5 2 with Android Jelly Bean, with a basic overlay. In the form of camera sensors , the Korean firm have interestingly only given the L5 2 a 5MP rear facing sensor. Whilst disappointing, given that the aforementioned Ascend G510, Xperia J and Galaxy Ace 2 all have a front facing snapper, we can be a bit forgiving as the low resolutions that were on offer almost made them redundant. LG has also graced the Optimus L5 2 with a 4-inch screen at 480 x 800 pixels, so by no means the HD definition that we've become accustomed to on flagship powerhouses, yet still clear enough for day to day use. Elsewhere, the L5 2 comes with 3G, Bluetooth and NFC. We said that L5 2 sits comfortably in the hand, and the 4-inch screen is easy enough to hit with one hand. Thankfully, LG has placed all the standard buttons in familiar (unlike on the Huawei Ascend G510) and easy to hit places, with the power/lock button on the right hand side, with the volume rocker sat on the left, just below a customisable quick key (more on that later). Just below the screen sit the almost traditional backlit soft keys, replacing the need for Android's on screen controls. We only mention the backlighting as we found that its exclusion on the Ascend G510 meant that the buttons were a little hard to see. The back and menu key sit either side of a physical home button. The home button has a nice LED light behind it, that illuminates whilst charging, during calls and alarms as well as for notifications and missed events. Downloaded apps can also make use of the light. In the way of ports, the Optimus L5 2 comes with the obligatory 3.5mm headphone jack (on the top) and the microUSB data/charge port in the base. We're big fans of the placement or the microUSB as it makes using the L5 2 easier whilst charging, as for the headphone port, the positioning debate will continue long after this review. The back cover is smart and fully removable, wrapping around the sides of the L5 2. The plastic has a brushed metallic look, and whilst completely smooth, provides a decent level of grip so you don't drop it. Along with the LG logo, are the loud speaker, camera sensor and LED flash. With the back cover wrapping around to the front of the L5 2, there is no set place with which to work the cover off. That said, we found it pretty easy to work our short finger nails under it at any corner, or buy using the gap for the microUSB port. The ease of removal left us a little worried about dropping the Optimus L5 2, but on the one occasion we did drop it (on carpet), we're pleased to say it stayed on. Behind the back cover there is access to the 1700mAh battery, the standard SIM slot, as well as the fiddly, hot swappable microSD slot. First impressions of the LG Optimus L5 2 are pretty promising. The plastic feel, and standard layout match the price tag, but being light and easy to use one handed show LG may have hit a sweet spot.